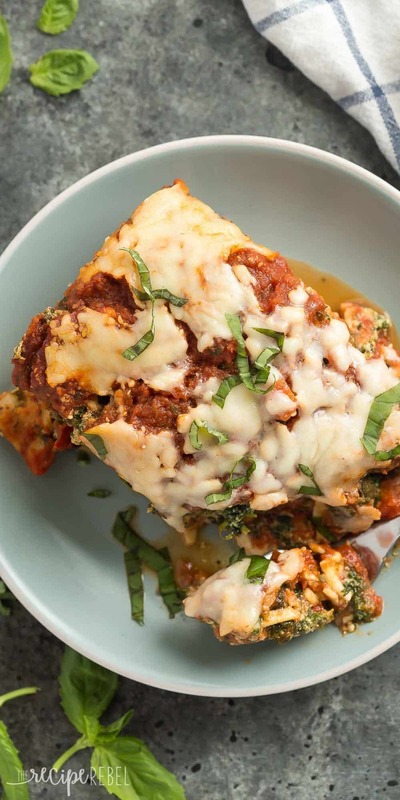 This Spinach Ricotta Slow Cooker Lasagna is as easy as it gets — no cooking meat or lasagna noodles beforehand! Just layer everything in the crockpot and let it cook. Perfectly cheesy and loaded with spinach! I’m not actually sure why I’ve never tried a slow cooker lasagna before today. As I’ve mentioned before, once I learned how to cook pasta in the slow cooker, my life was forever changed. This Slow Cooker BBQ Chicken Chili Mac, and this Healthier Slow Cooker Hamburger Helper are proof. And interestingly enough, this is my second slow cooker pasta recipe this week. I posted this Slow Cooker Baked Ziti on Monday for National Pasta Day! 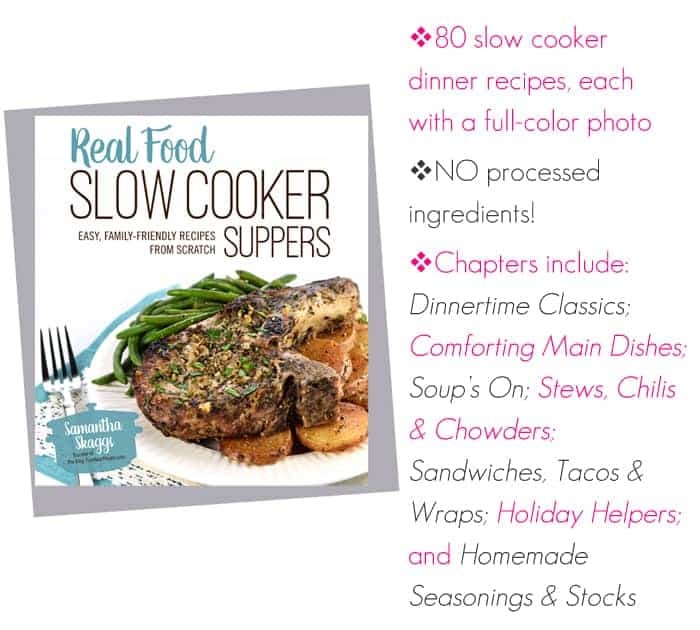 This recipe is from my friend Samantha’s new cookbook, Real Food Slow Cooker Suppers. 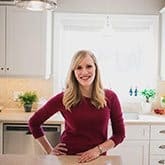 I was so excited to get this cookbook and share it with you guys! It’s full of two of my favorite things: (1) Real Food and (2) slow cooker recipes! In this crazy time of year, I think you can agree we all need more of them! I was so happy with how this lasagna worked out! Not to mention the house smells amazing while it’s cooking. 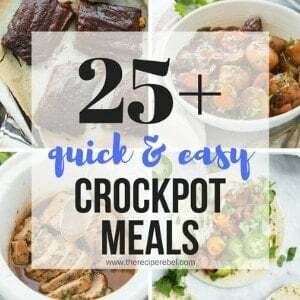 I love having a few 3-4 hour slow cooker recipes on hand for those days when you’re going to be out of the house just before dinner time for one occasion or another, and you want to come back and have it all ready for you. It’s perfect for weekends with the family! 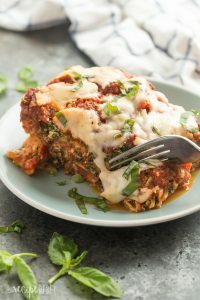 This Spinach Ricotta Slow Cooker Lasagna is as easy as it gets -- no cooking meat or lasagna noodles beforehand! Just layer everything in the crockpot and let it cook. Perfectly cheesy and loaded with spinach! In a large bowl, combine the spinach, ricotta, egg, parsley and ¾ cup Parmesan cheese. In another large bowl, combine the pasta sauce, water, tomato paste, Italian seasoning, garlic powder and red pepper flakes. Lightly grease a 6 quart slow cooker. Spoon ½ cup tomato sauce into the bottom of the slow cooker and spread into a thin layer. Place 3 lasagna noodles in the bottom, breaking to fit if necessary. Spread ¼ of the ricotta mixture over noodles, and top with ¼ of the sauce. Sprinkle with 1 cup mozzarella cheese and 2 tablespoons Parmesan. Repeat layers 3 times, starting with the noodles and ending with the cheese. Cover slow cooker and cook on low for 3.5-4 hours until noodles are tender but not overcooked. Turn off the slow cooker and let lasagna set for 30 minutes before slicing and serving. In a large bowl, combine the spinach, ricotta, egg, parsley and 3/4 cup Parmesan cheese. Lightly grease a 6 quart slow cooker. Spoon 1/2 cup tomato sauce into the bottom of the slow cooker and spread into a thin layer. Place 3 lasagna noodles in the bottom, breaking to fit if necessary. Spread 1/4 of the ricotta mixture over noodles, and top with 1/4 of the sauce. Sprinkle with 1 cup mozzarella cheese and 2 tablespoons Parmesan. Anybody else doing this might want to make frozen ready for the crockpot meals to include with their gift, or even as a gift. Made a bunch of meals for my kids when they had a baby, included directions written on freezerbag ( di that before filling). They loved them. They stacked them in freezer and pulled them out for the busy days. Hello! I’m a little late to this lasagna party but I was wondering, why can’t we use oven-ready sheets? It’s what I have handy but it’s too hot where I am to turn on the oven right now, so I’m hoping this recipe is the answer. Thanks in advance! I think you definitely could but I likely wouldn’t cook it as long and you might not need as much moisture. I STILL have yet to try crockpot lasagna but this seriously looks so good I don’t even know what’s stopping me!! Also, GIRL!! How do you get lasagna to look so dang pretty in your pictures?? I saw the title of this and I immediately thought Slow Cooker LASAGNA?! And then I read your first line and I had to laugh. Clearly you are a mind reader. 😉 I am freaking out over how genius this is Ashley!! Seriously, where do you come up with all these beyond fabulous ideas?! 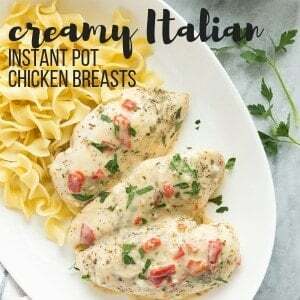 I am TOTALLY making this next week for dinner! And if Boy is lucky I will share. Lol. Pinned! Cheers! Yummy! 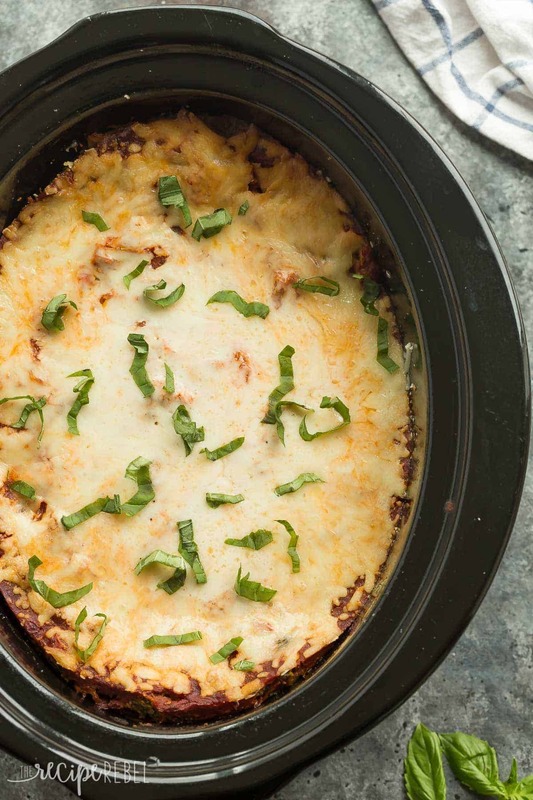 I can’t believe I’ve never thought of slowcooker lasagna before either! I love how creamy it looks! Hi Ashley! Another winner! I always add spinach to my lasagna, not necessarily for the added veg but because I just plain like it! I think I’m going to get my son a slow cooker for Christmas, along with a compilation of recipes. He likes to cook, but he is a busy guy and I know some nights he just isn’t up for cooking. 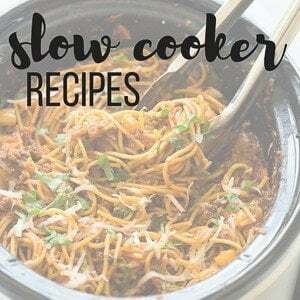 The slow cooker is so perfect for those nights! I rarely add spinach to my lasagna, but I’m definitely going to start now! Thanks Dorothy! 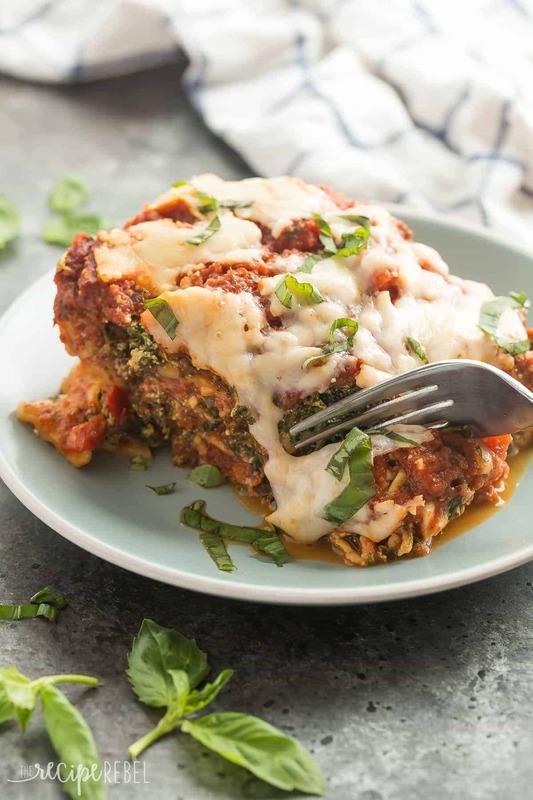 OMG I love magic of slow cooker 😛 and this lasagna sounds so good!! I might make it for the weekend!! Say no more… you had me at slow-cooker! 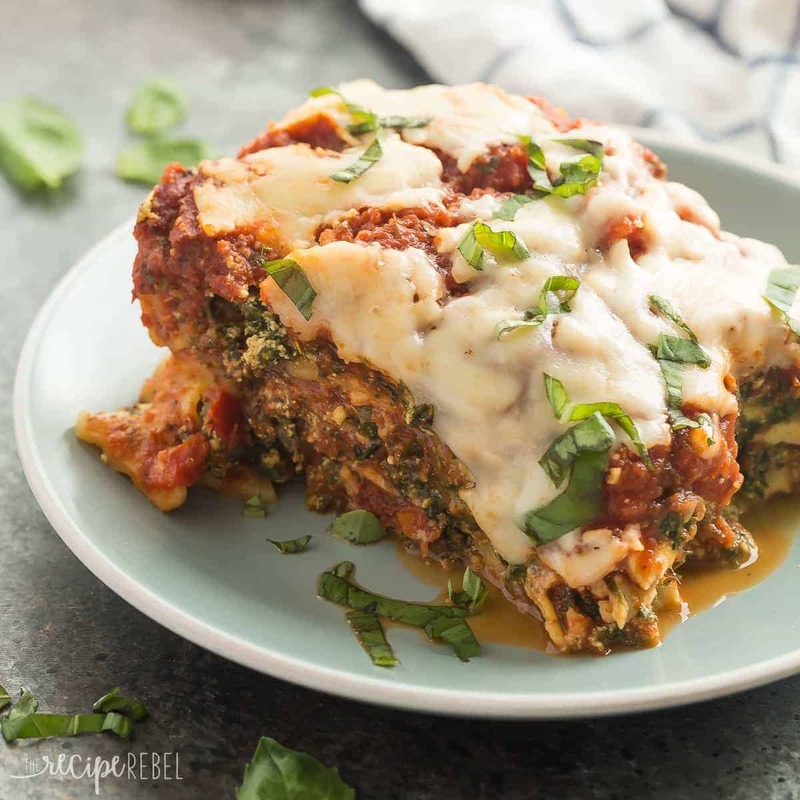 You also had me at lasagna though – I’m an Italian food fanatic, so I can never have enough slow-cooker recipes or Italian recipes. Also taking note of your Ziti recipe! You are nailing it with awesome dinners this week, lady! Haha! Don’t worry, next week is dessert after dessert after dessert. Lol. You are on a roll with slow cooker dishes! I’ve made lasagna in the slow cooker once, years ago, and I need to do it again! Love this spinach ricotta version…my kind of comfort food!